Hydrogen Peroxide Topical Solution USP (3%). First aid antiseptic to help prevent the risk of infection in minor cuts, scrapes, and burns. Oral debriding agent aids in the removal of phlegm, mucus, or other secretions associated with occasional sore mouth. Latex-Free. 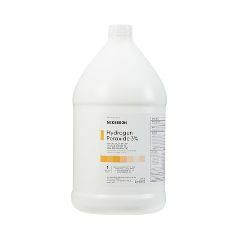 Question: What grade should be used to sanitize surfaces, such as floors and counters? Fastest shipping I've ever seen! Cleaning Laundry Oral rin. Cleaning Laundry Oral . I use everywhere I use a spray cleaner. Cuts grease better than anything. I spray my floors before mopping and to clean inside and out of the icebox. I clean up spills that contain sugar. It's never sticky when you use peroxide. I add to my laundry. I use as a mouth rinse. I spray the filters in my ac after washing them. I clean my hummingbird feeders with it. I spray it on faucet handles to kill germs. Peroxide is amazing. Was replaced in 1 day. Like the large size. I use instead of alcohol swabs for twice daily shots. Good mouth rinse. Hoping it will take some blood stains out of cotton. Nothing I can think of :). Best find right to door!. I read on FB that if you put HP in your humidifier gets rid of allergens, bacteria and my allergy stopped - wheezing and coughing stopped as soon as I started putting HP in my humidifier and instead of purchasing small bottles stocking up on gallons, 2 cups per 1 gallon distilled water need it here in Tucson desert! Thanks! Good Price - what ordered.